“In a world of secrets, where evil has reigned for over a hundred years, there lives a treacherous blood covenant and vast fortune guarded by a dark prophecy that will change the life of one man forever” in the suspense, PG-rated drama “The List,” debuted on DVD June 10th from Fox Home Entertainment. Featuring performances from veteran screen legend and Golden Globe® nominee Malcolm McDowell (“A Clockwork Orange,” “Halloween”), Chuck Carrington (“JAG”), Hilarie Burton (“One Tree Hill”) and Will Patton (“Remember the Titans,” “Armageddon”), “The List” is based on the first novel by best-selling author Robert Whitlow and timed to coincide with his latest book release, Deeper Water. After being shaken by the news of his father’s mysterious death, Renny Jacobson (Carrington) is mystified to discover that his father has left him nothing but a reference to an obscure entity called “The Covenant List of South Carolina, Ltd.” Setting out on a quest to learn the truth, he uncovers a treacherous blood covenant and vast fortune guarded by a dark prophecy that will change his life forever. Joined in the spiritual battle by some unlikely and courageous heroes, he soon finds he must fulfill the prophecy spoken in 1863 and destroy the power of “The List,” or risk losing the true treasure that has changed his life. 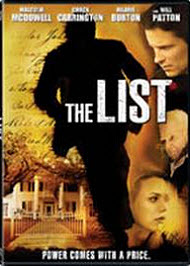 See REVIEW of “The List” for more details.